Okay, day 4 of swine flu and I’m getting bored by it already. If I don’t start seeing mass infection rates and death I’m going back to my Family Guy DVD collection. Here’s the latest, fears it will mutate to be resistant to Tamiflu, the numbers inside NZ of suspected cases trebled over night and most interesting the possibility that this swine flu has it’s source from Mexican intensive pig farming practices. 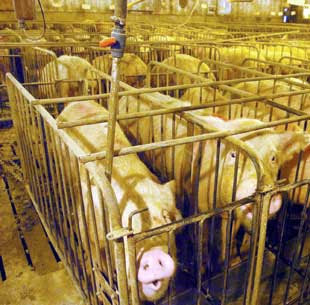 Animals mass produced in such cruel environments need massive doses of antibiotics to keep them disease free, but that has complications (one of them being disease resistant viruses) and with Mexican locals fearing the pig waste is leaking into their water supply, it may be an idea to actually ask if that cheap bacon is worth the possible cost to us from such cruel farming products. There would be a wonderful irony if a pandemic that killed millions of humans was started from cruel farming practices used purely to create cheap meat. LATEST The World Health Organisation has raised the pandemic threat level from swine flu to phase 5 as the virus spread and killed the first person outside Mexico, a toddler in Texas. WHO Director-General Margaret Chan made the decision to raise the alert level from phase 4 - signifying transmission in only one country - after reviewing the latest scientific evidence on the outbreak. "I have decided to raise the level of influenza pandemic alert from phase 4 to phase 5," Chan told a news briefing. Phase 5 is the WHO's second highest level of warning that a pandemic, or global outbreak of a serious new illness, is imminent. Phase 6 means a pandemic has begun. People are dying and more likely to be those who are poor. The disease comes from an American company using low wages and low environmental controls in Mexico to maximise profits. The report on RNZ said its probable cause was from the waste from this intensive farming practise passing through the community. This is directly applicable to our intensive farming operations and the 'flow-on' effects of waste. - FONTERRAISTS anyone?! I'm fasinated by it and confident our Pandemic Plans will hold up (fingers crossed). Why do you assume the people dying are more likely to be poor? Surely the kids who could afford to go on a school trip to Mexico wouldn't fall into this category? I was under the impression that this disease could be passed by touch as well as by air borne bugs ... if so, aren't the face masks a bit random? Could be the first stage in a plot to get everyone to eventually wear burkha's. Still not doing any research are we folks? "Why do you assume the people dying are more likely to be poor? " Mexicans living in shanty towns with open sewers flowing throuh them are likely to be poor. They come into Mexico City to work, spead it on to the rich kids in the Hotel etc. The difference is medicine and access to health care is inaccessable to the poor and so they are more exposed to the initioal contamination and more likely to die as a result. im scared :-( . . . . .
You're right swine flu is boring.